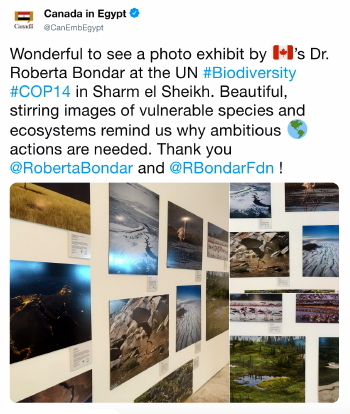 Showcased during the UN Biodiversity Conference are some of Dr Roberta Bondar’s photographic images featuring wide-ranging bio-diverse portraits of both North American and African species from varied ecosystems. 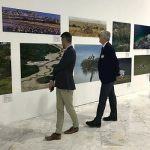 The Roberta Bondar Foundation presents this Travelling Exhibition and Learning Experience to support Dr. Bondar’s global efforts to raise awareness of species at risk and to include a glimpse of The Foundation’s newest research & education project, Avian Migration Aerial Surface Space [AMASS]. 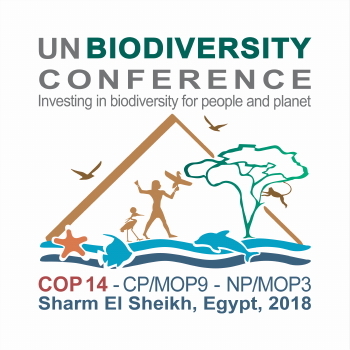 As Sharm El Sheikh hosts the 14th meeting of the Conference of the Parties [COP14] to the UN Convention on Biological Diversity, attendees aim to accelerate transformations needed to achieve the three objectives of the UN Convention on Biological Diversity: conservation; sustainable use; and equitable sharing of the benefits resulting from the utilization of genetic resources. 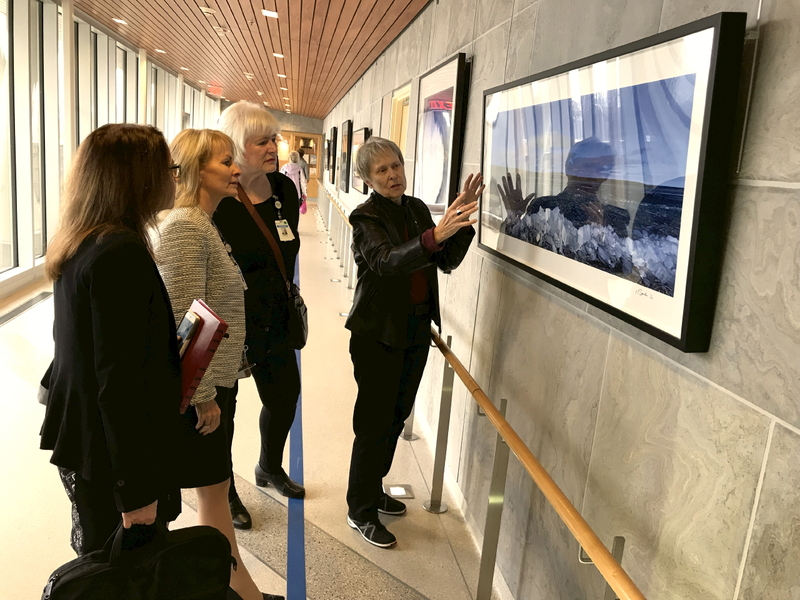 Dr. Bondar donated eight of her landscape photographs to Royal Victoria Regional Health Centre [RVH] through The Roberta Bondar Foundation. After several months display in Barrie hospital’s David McCullough Hearts and Minds Gallery, these images will form part of the RVH permanent collection. Following the installation of these photographic images, Dr. Bondar addressed ethical leadership in her presentation “Leading Through Time and Space” to attendees of the RVH Leadership Program. Pieces of the RVH collection display throughout RVH. On Friday night, Dr Roberta Bondar – Canada’s first female astronaut – was shocked when the Thebacha and Wood Buffalo Astronomical Society [TAWBAS] renamed its observatory after her! Mike Couvrette, TAWBAS Chair, says the society chose to honour Bondar because of the important role she has played in the growth of the society. 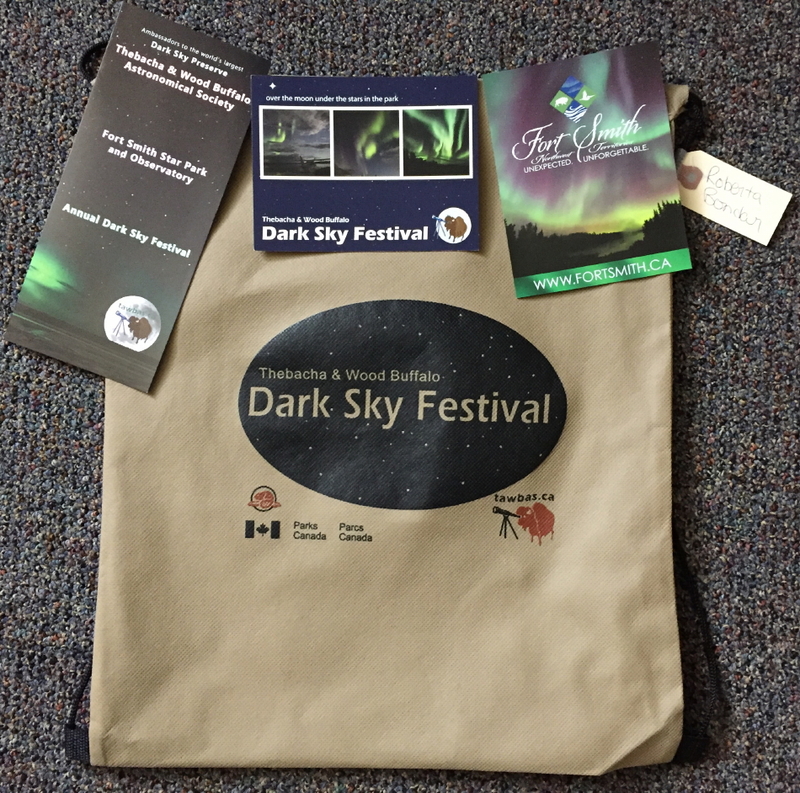 Dr. Roberta Bondar joined co-presenters Nicole Mortillaro and Roland Dechesne at the 4-day Thebacha & Wood Buffalo Astronomical Society‘s Dark Sky Festival. This annual action-packed event occurs at the Fort Smith Star Park & Observatory and Wood Buffalo National Park Dark Sky Preserve. Activities over this intense weekend include an Observatory tour, Night sky viewings, Model rocket making, AuroraNauts programs, seminars, workshops, astrophotography, WBNP nature excursions, Salt River FN ceremonies, Presenter’s workshops, Dinners, Rover competitions, Guest Presentations Q+A. MORE IN OUR PHOTO GALLERY right here! 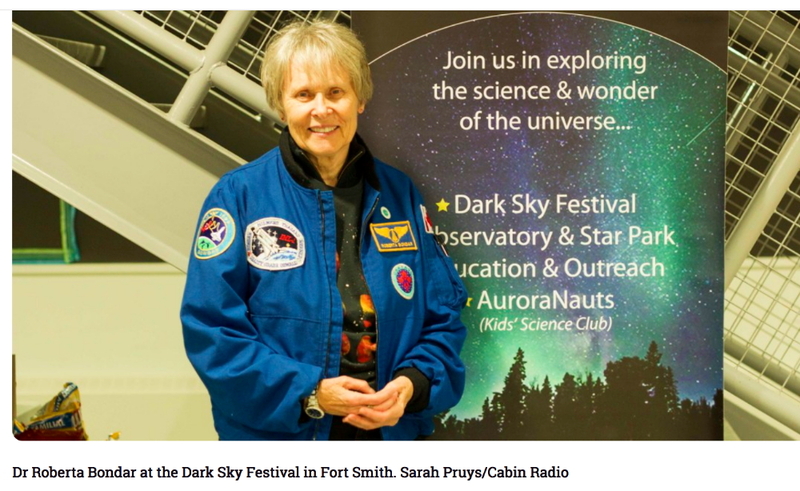 Fort Smith observatory named for Canada’s first female astronaut: Dr Roberta Bondar shocked! 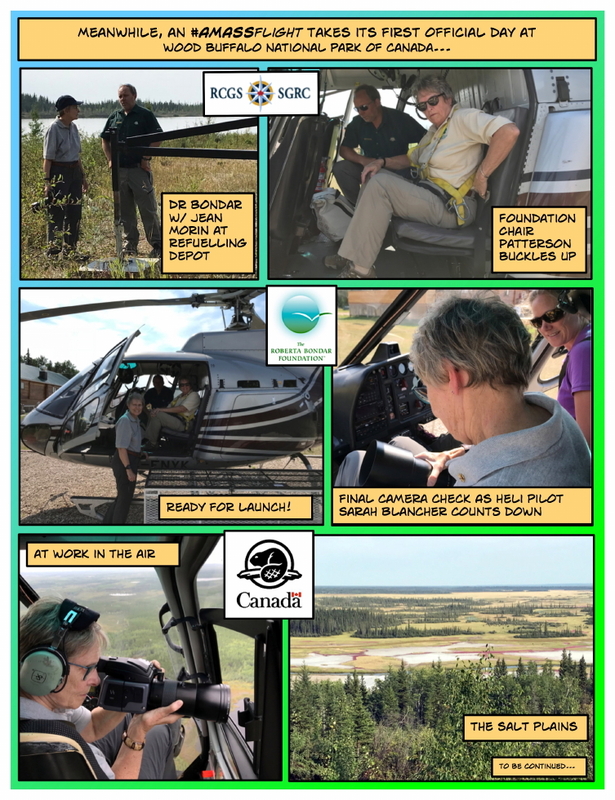 A new education initiative from The Roberta Bondar Foundation, Avian Migration Aerial Surface Space [AMASS] seeks “to promote the protection of safe, sustainable habitats for migrating birds” with The Foundation’s regional and global partners. 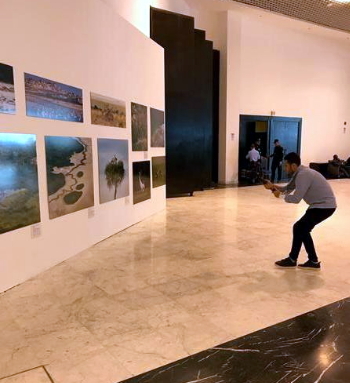 The Foundation aims to spark global conservation using its tools of “art and science, story telling and dynamic imagery to understand and communicate the scope and scale of international avian migratory pathways” and inspire people to act and to empower individual action. The AMASS project will provide context and scale from different perspectives – surface, aerial, and spaceflight. where it captured images and video footage of the endangered Whooping Crane, its nests, and its extensive habitat. The Whooping Crane is one of six migratory species to be examined. The Foundation uses #AMASSflight to facilitate the project’s social media collation. Children taking part in this year’s Bondar Challenge camp were at Beavermead Park Friday morning, learning about digital photography. Spaces are still available for kids 9-15 in the Aug. 9-10 and Aug. 16-17 camps. The camps, presented by Riverview Park and Zoo and Otonabee Conservation and developed by the Roberta Bondar Foundation, run a day and a half and involve trips to the zoo, Beavermead and Warsaw Caves. 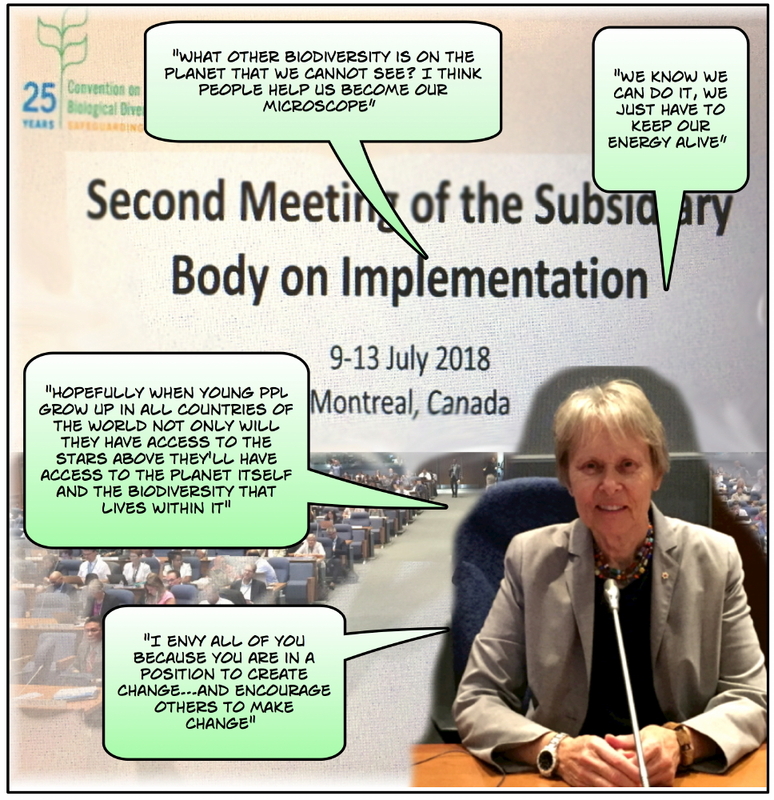 Dr. Roberta Bondar delivered the Keynote address to inspire and cheer on the international delegates to the UN Convention of Biological Diversity #SB!2018. Her address, along with other program highlights, were live-streamed on Facebook. After her Keynote address, Dr. Bondar sat for this interview. Roberta Lynn Bondar, C.C., O.Ont. As a scientist and environmental advocate, Dr. Roberta Bondar continues to inspire Canadians. Following her pioneering spaceflight, she remained active in international space medicine, notably leading a research team at NASA that drew connections between astronauts’ recovery from microgravity and neurological illnesses on Earth. 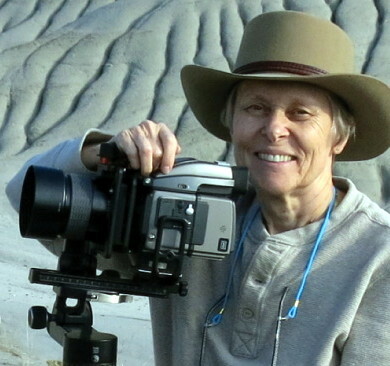 A world acclaimed photographer, she has demonstrated commitment to environmental sustainability through her stunning works that reconnect people to our natural world. Leading by example with the establishment of her eponymous foundation, she is a champion of education and the environment. 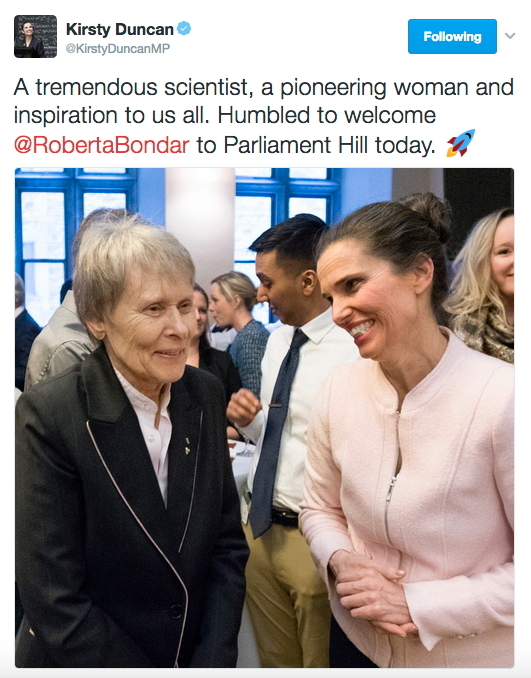 Excuse us, but those Canada Day headlines about Dr. Roberta Bondar are 26 years late! 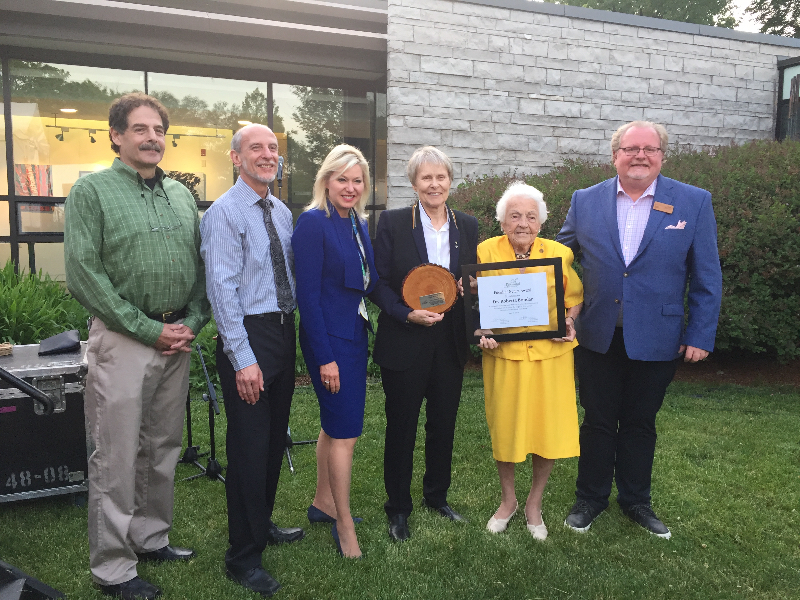 At a special evening event, the Riverwood Conservancy honoured Dr Roberta Bondar with their Friend of Nature Award — the award’s launch and inauguration. The Riverwood Conservancy comprises 150 acres of City of Mississauga and Credit Valley Conservation river and wildlife areas, trails and public spaces. – Dr. Roberta Bondarfor the volunteer appreciation evening for Circle of Care at Temple Sinai. Bondar referenced her early years of volunteer activities growing up in her hometown of Sault Ste Marie. She reminded the audience of the impact they make on lives they support, encourage, and inspire. That’s 11 classrooms totalling 262 students ranging from JK through 6th grade. That’s 262 students who composed 524 photographs! Principal, Scott Woolford welcomed proud parents and their talented young image makers as they checked out the final display. Joining the throng for the Toronto District School Board were John Malloy, Director of Education, Jane Phillips-Long, Superintendent of Education, and Chris Moise, Trustee. 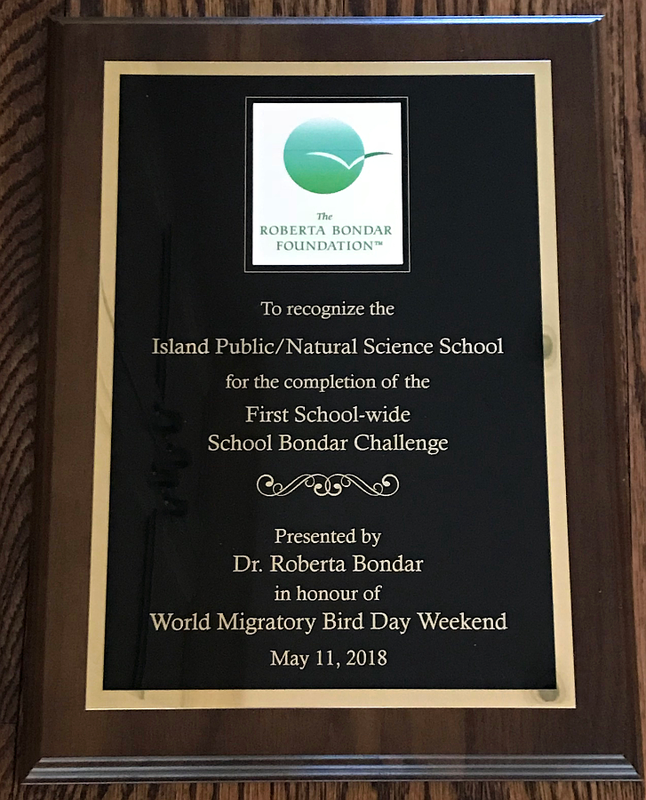 The Roberta Bondar Foundation also gifted the school with two hummingbird feeders for their outdoor classrooms; more motivation for students to engage with the feathered speedsters in their environment. The Roberta Bondar Foundation joins its president in congratulating UNEP and ministers from the Republic of Congo, the Democratic Republic of Congo and the Republic of Indonesia who signed the Brazzaville Declaration asserting their commitment to collaborate, to preserve and protect the largest tropical peatland area in the world – the Cuvette Centrale. Join Canada’s first female astronaut in space, Roberta Bondar, M.D., Ph.D., for an inspirational talk as the Canadian Museum of Nature celebrates International Women’s Day. 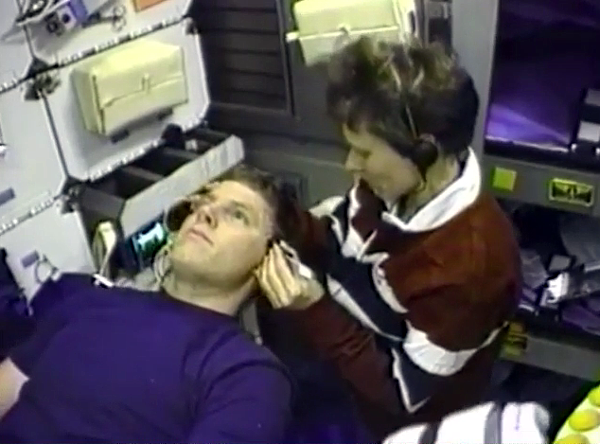 In 1992, Dr. Bondar flew on the NASA Space Shuttle Discovery. She was the world’s first neurologist in space and conducted over 40 research experiments for 18 countries on this international flight. 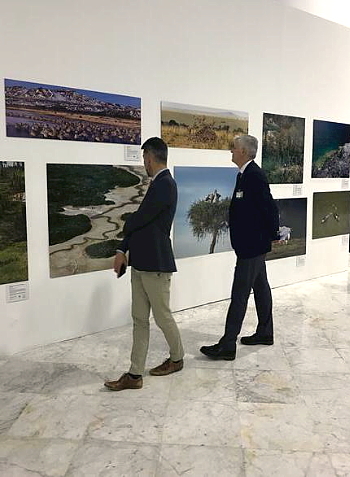 A passionate and accomplished photographer, Dr. Bondar’s landscape photographs are featured in travelling exhibitions, books and other publications. The exhibition, Light in the Land ~ The Nature of Canada, presented by The Roberta Bondar Foundation, is currently on view at the museum. And right in time for International Woman’s Day comes the happy announcement that Lone Wolf Robotics Wins World Video Award as teammates, Tiana Bressan and Tia Bariciak share their source of inspiration, Dr Roberta Bondar, in their STEM educational production. Naturally, we find Dr Bondar inspiring… and she is also very hard to keep up with. However, we have come to learn that both Tiana and Tia are also inspiring young women! And we’ve always thought their Lone Wolf Robotics were awesome, too! 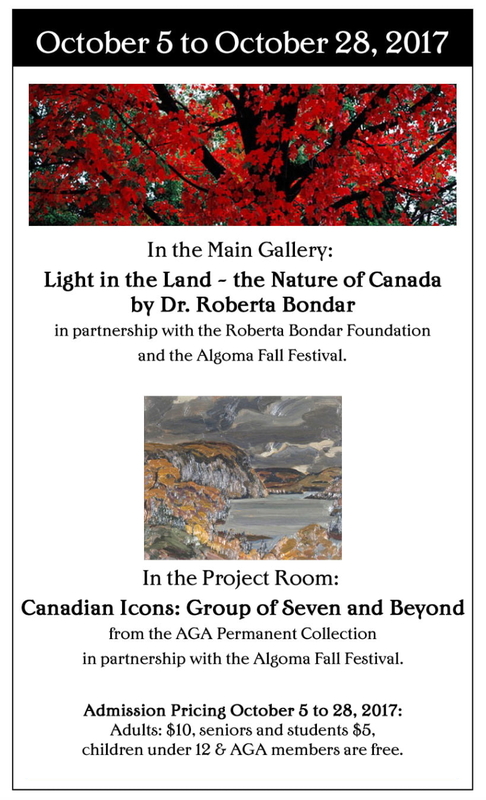 Light in the Land ~ The Nature of Canada, an exhibition of photographs by Dr. Roberta Bondar, visits the Art Gallery of Peterborough from January 27 to April 8, 2018. Capturing her personal experiences of Canada’s lands in texture, colour, composition and clarity, Bondar encourages visitors to experience her view of our country’s landscapes. “Response here has been fantastic and our visitors are steady and consistently thrilled! Light in the Land ~ The Nature of Canada, an exhibition of photographs by Dr. Roberta Bondar, is on display in the rotunda of the Canadian Museum of Nature from January 13 – March 31, 2018. Discover the fusion of art and science in the texture, colour, and composition of our landscapes as captured through the lens of Canadian astronaut, Dr. Roberta Bondar. 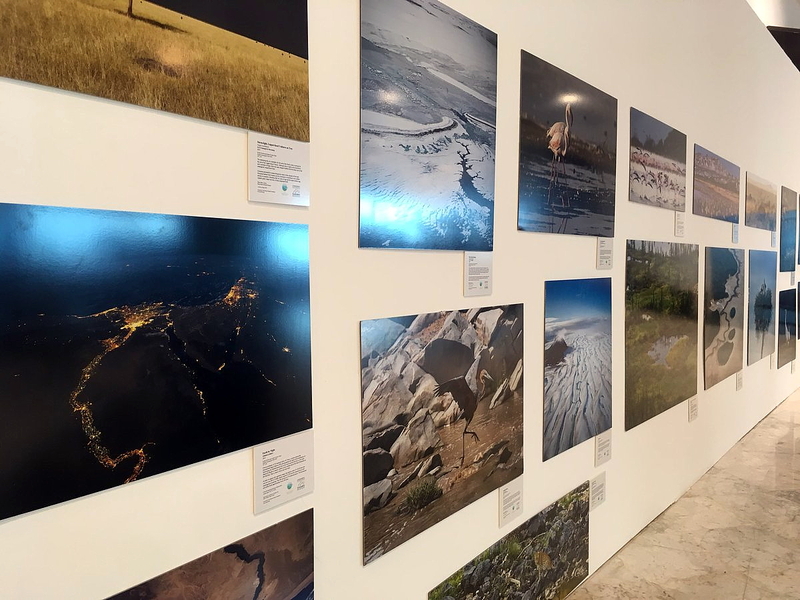 On the trail of one of the Art Gallery of Algoma [AGA] Bondar Challenge participants, Dr. Roberta Bondar caught up with the young photographer in Toronto. Bondar presented Katelyn Godin with a framed print of her beautiful AGA Bondar Challenge submission. 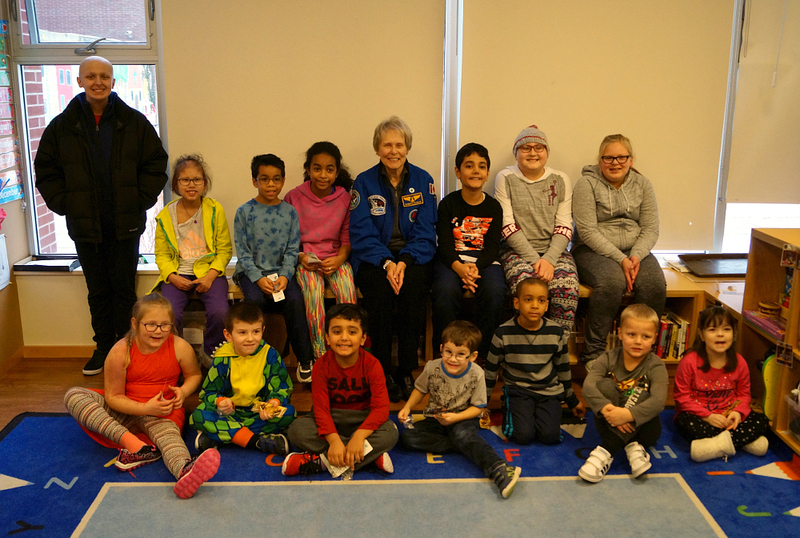 Katelyn’s classmates shared in the excitement as Dr. Bondar visited with them all, answering questions and telling stories about life in space. 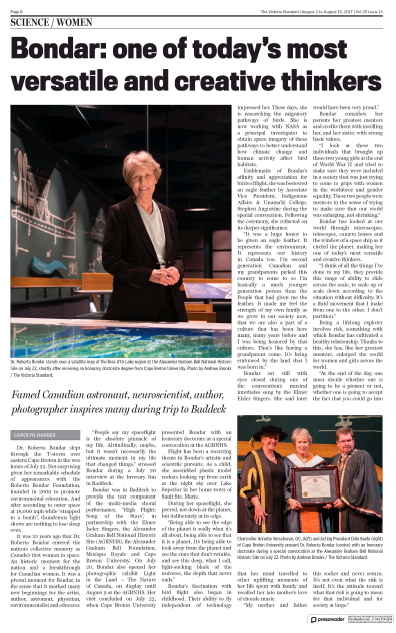 As it marks the 150th anniversary of confederation, The Philanthropist includes a Q & A feature on Dr. Roberta Bondar as the publication profiles 150 Canadians from across the non-profit sector who work or volunteer in Canada’s social sector. 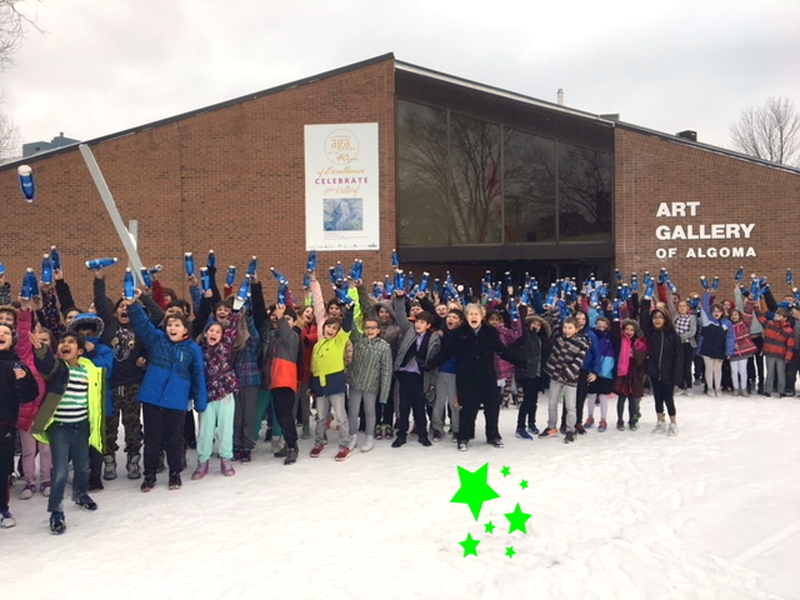 175 Algoma District students who worked through the Art Gallery of Algoma Bondar Challenge this Fall, celebrate the Opening and Presentation by Dr. Roberta Bondar of the AGA’s exhibition of participants’ photographic images. Each image is accompanied by an Artist’s Statement about its meaning and intent. Roberta Bondar visits RMHC Toronto to present Katelyn Godin with framed print of her AGA Bondar Challenge submission. 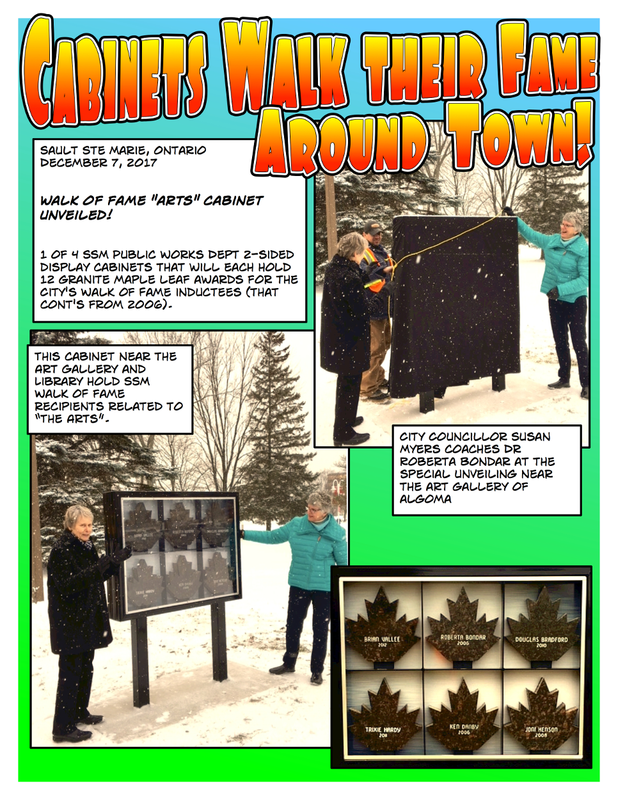 The Case(s) of the Sault Ste Marie Walk of Fame! The completion of Sault Ste. Marie’s Walk of Fame restoration project was celebrated in a ceremony as the Sault’s Canada 150 Honorary Chair and one of the City’s first Walk of Fame recipients, Dr. Roberta Bondar, unveiled the display case located at the Art Gallery of Algoma, one of four locations throughout the downtown. 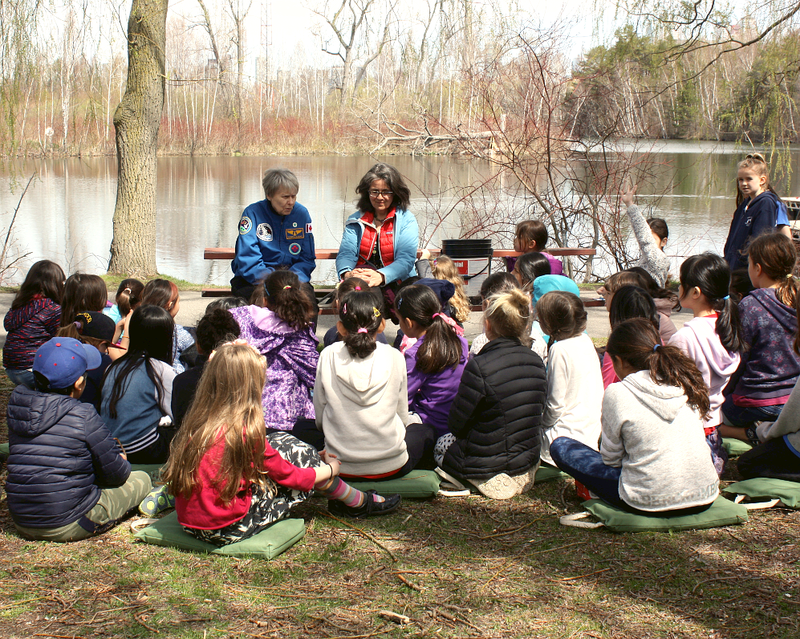 A special launch event honoured the many achievements of a true pioneer, Canadian icon, and environmental education advocate, Dr. Roberta Bondar. Eco-Heroes are presented each year at the Planet in Focus Environmental Film Festival to both Canadian and International individuals whose body of work has had significant impact on raising awareness of environmental issues through artistic expression. The evening included a talk by Dr. Bondar and an interview conducted by Ziya Tong with audience questions. Tasha Kheiriddin speaks with the legendary Canadian about the award, and her environmental focus. Examines the interlinks between Science, Art, and Dr Bondar’s nationally touring exhibit Light in the Land — the Nature of Canada, currently showing at the Lunenburg School of the Arts — on public exhibit until September 16. Dort engaged the former astronaut in a discussion about this Travelling Exhibit and Learning Experience [TELE], Science, Art and the challenges Bondar continues to set for herself. This feature article is packed with answers to Barber’s insightful questions. In her interview at Cape Breton University’s special convocation in the Alexander Graham Bell Historic Site, Barber also relays several of Dr Bondar’s meaningful moments, memories, and views about Learning, Life, and the planet. 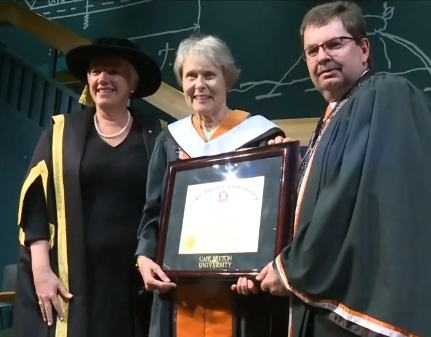 Highlights of Cape Breton University’s Special Convocation to award Dr Roberta Bondar a honorary degree, recognizing her contribution to space medicine research. In the interview segment, Dr Bondar highlights the several interests she shares with Mabel Hubbard Bell — although almost a century apart — art, science, technology, and business. From her view of Bell’s Silver Dart replica hanging above the ceremonies representing Canada’s first powered flight to her own memory of orbiting the Earth in STS Discovery — and all within 80 years of each other — the vision of Cape Breton University‘s special convocation in this most appropriate of Canadian aviation sites was never lost on Dr Bondar. 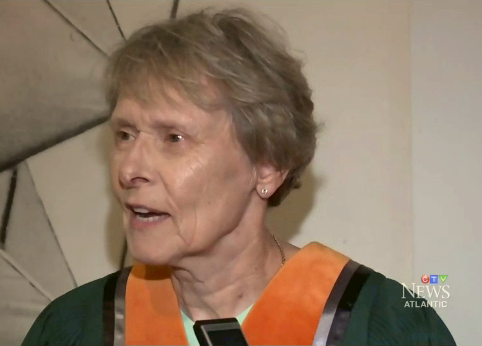 Canada’s first woman in space to receive honorary CBU degree in Baddeck Roberta Bondar encourages students to explore a more liberal education. First neurologist in space, Dr. Roberta Bondar, will receive an honorary CBU doctorate of letters “for her pioneering contribution to space medicine research” during a special convocation ceremony at the Alexander Graham Bell Museum. Light in the Land ~ The Nature of Canada, the newest Travelling Exhibition and Learning Experience [TELE], opens in Nova Scotia! Created specifically by The Foundation to honour the 25th anniversary of her historic flight into space, this TELE features 14 of Dr. Roberta Bondar’s large, fine art photographs. Sootoday.com captured the special 25th anniversary Welcome Home given to Dr. Roberta Bondar at the Sault Ste Marie Airport. SSMADC Director, Gino Cavallo, introduced speakers and the presentations to Dr. Bondar by the Chair, SSMADC Board of Directors, Jerry Dolcetti, and by the Mayor, City of Sault Ste Marie, Christian Provenzano. Well done, All! Thank you for “getting us in” to the event! The Content Team at saultonline.com had the Welcome Home Dr Roberta Bondar event covered! The airport presentations included the naming of the Airport’s access road in her honour and receiving a Key to the City. Great photo gallery captures the excitement, the fun, the love, and the emotion. 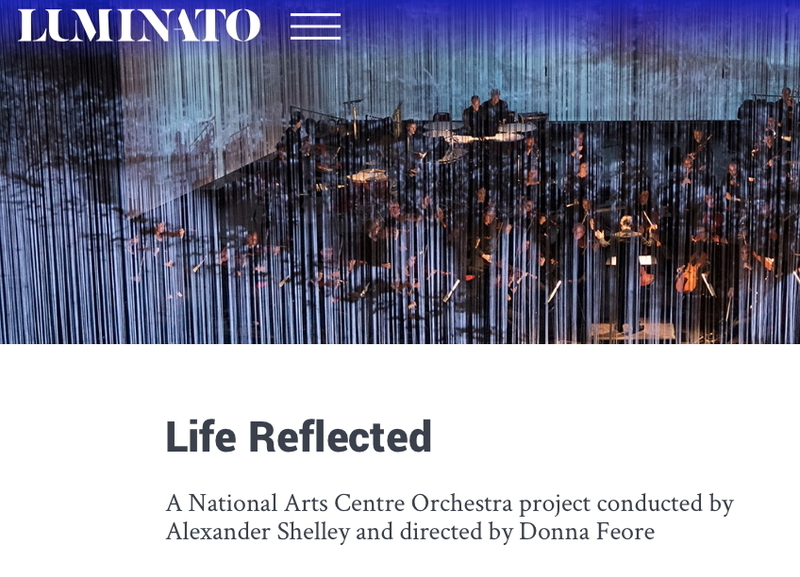 Sunday, June 18: Luminato 2017 Performance of the National Arts Centre Orchestra’s celebrated Life Reflected , director and creative producer Donna Feore’s merge of storytelling, original compositions, and immersive multimeda to reflect four legendary Canadian women: anti-bullying advocate Amanda Todd (My Name is Amanda Todd), writer Alice Munro (Dear Life), astronaut Roberta Bondar (Bondarsphere) and poet Rita Joe (I Lost My Talk). This year marks 110 years since the formation of the Aerial Experiment Association by Mabel Bell – the first woman in the world to fund, form and manage an aviation company. 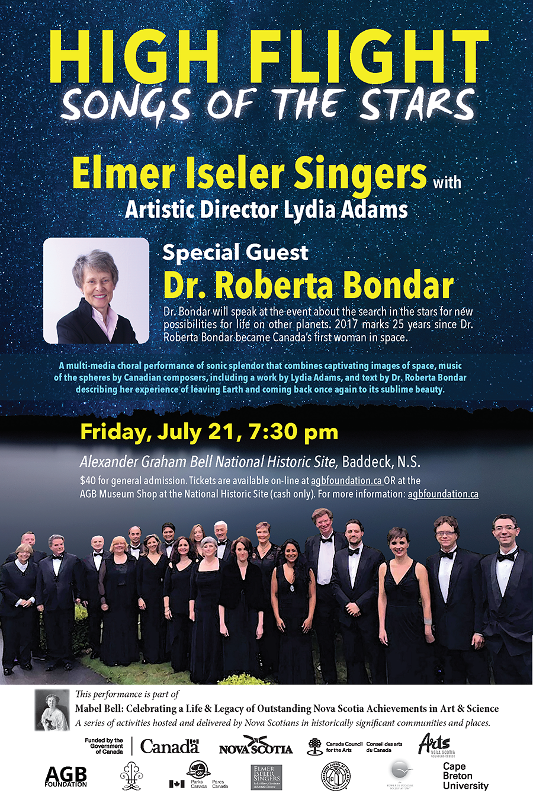 From July to September in Lunenburg and Baddeck, the Silver Dart anniversary committee along with Canada’s first woman in space Dr. Roberta Bondar presented a series of events in several venues, for a variety of ages to help celebrate Nova Scotia’s significant achievements in the areas of history, arts, science and technology. Cathy Dobson, The Sarnia Journal, reports that Dr. Bondar, keynote speaker at an Enbridge Famous 5 event (Sarnia), spoke of her concerns about the planet’s finite resources, offering advice and encouragement to students in the audience, saying We harm the environment at our peril. The Enbridge Famous 5 speaker series pays homage to five Albertan women, all activists in the early-mid 20th century who championed the rights and welfare of women and children. (SUDBURY, ON) — A unique, new travelling exhibition, Light in the Land ~ the Nature of Canada, opens today at Science North. The exhibition, designed by The Roberta Bondar Foundation, has been curated to honour the 25th anniversary of Dr. Bondar’s space mission. It features 14 oversized fine art photographs of the Canadian landscape from sea to sea to sea. Michael Harding, InnovationOxford, leads Roberta into motivations and memories from her childhood through her education, summer jobs, and years of diverse training to her present in this 25th Anniversary commemoration of her flight aboard the First International Microgravity Laboratory. In taking Dr. Bondar through her professional life, Harding manages to re-view and reveal uncommon, special, meaningful moments from those 25 years to catch up on her subsequent and continuing achievements. The Sault Ste. Marie Science Festival that kicked off Monday, April 24th sparks an interest in science among all age groups and creates an opportunity to celebrate science. Dr. Roberta Bondar, a former Science Fair winner herself when a 9th grade student, made her way around the exhibits stopping to speak with participants and to ask questions about their interests. 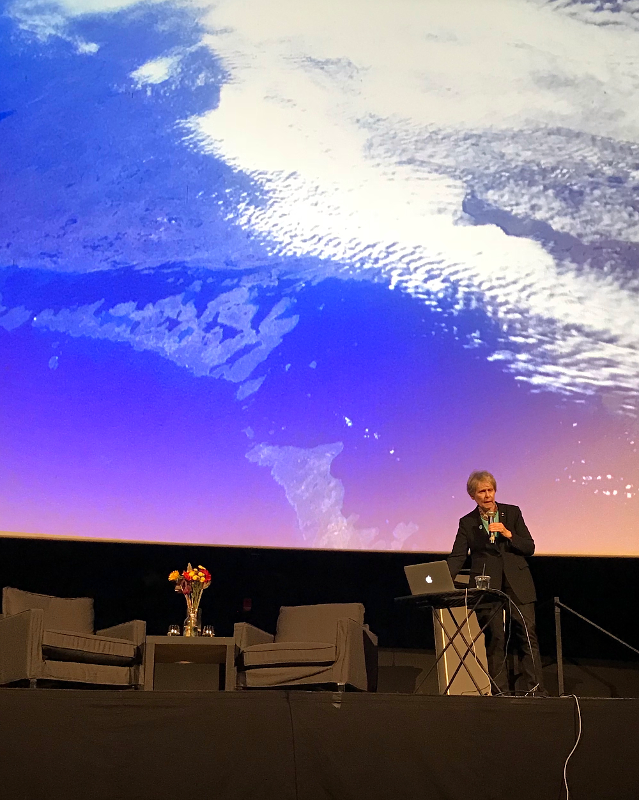 >Science North and The Roberta Bondar Foundation have formed a new partnership to celebrate the 25th anniversary of Dr. Roberta Bondar’s historic space travel with Earth Matters, a multi-city series of guest appearances throughout Northern Ontario focused on the trailblazing astronaut’s love for this planet. The inspirational seven-stop series, which kicks off on April 25 at the Sault. Ste. Marie Science Festival in Dr. Bondar’s hometown, is part of Ontario’s 150th anniversary celebrations. 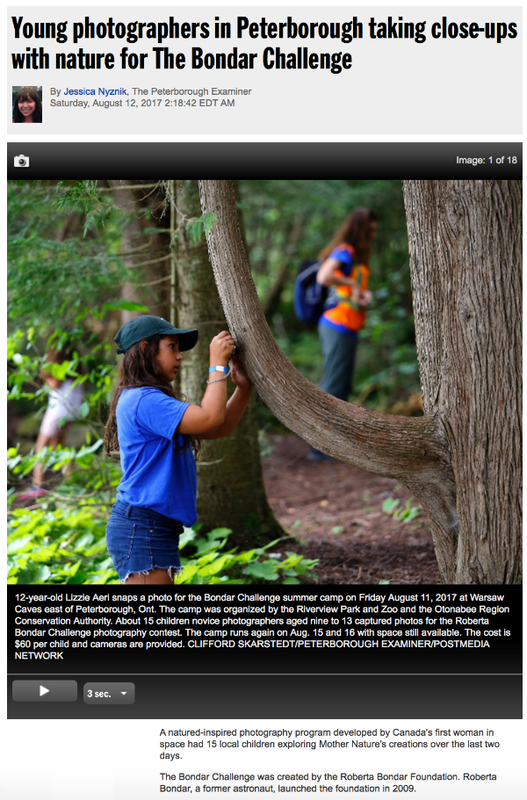 The initiative also incorporates the photography-based Ontario150 Bondar Challenge. TVO’s multimedia journalist and current affairs host, Nam Kiwanuka talks with Dr Roberta Bondar about space flight aboard the First International Microgravity Laboratory and how it impacts Dr Bondar’s view of life on Earth. Their conversation covers a diverse range of topics — science, creativity, professional landscape and nature photography, and The Roberta Bondar Foundation’s environmental awareness and education programs. Kiwanuka guides Dr Bondar through milestones, motivations, microgravity, and medicine. Quick-paced. Informative. Fun. The Woodstock Art Gallery presents Windows onto the Wild from Saturday February 18 until Friday June 30. This is a customized and carefully curated Travelling Exhibition and Learning Experience [TELE] from The Roberta Bondar Foundation. 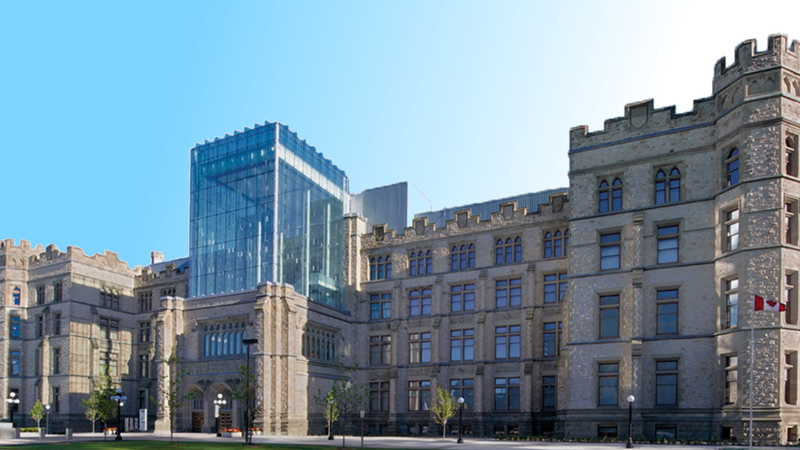 Opening Reception includes a “Walk and Talk” with Dr Bondar to help launch Windows onto the Wild — all part of The Gallery’s and Dr Bondar’s co-mission to encourage, through art, an appreciation and better understanding of the natural environment. 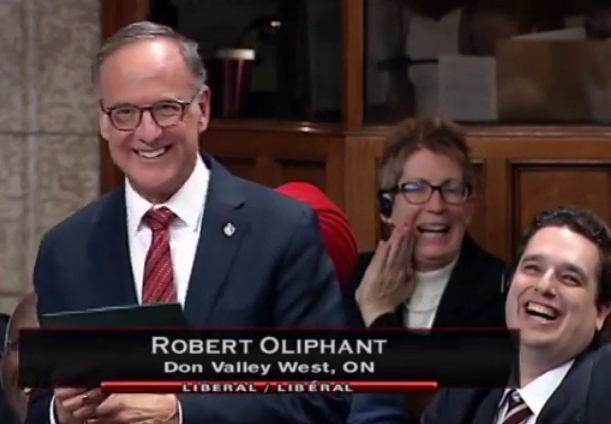 Senator, The Honourable Patricia Bovey joined parliamentarians in paying tribute to Dr. Roberta Bondar on the 25th anniversary of her flight, working in the precursor of the International Space Station. 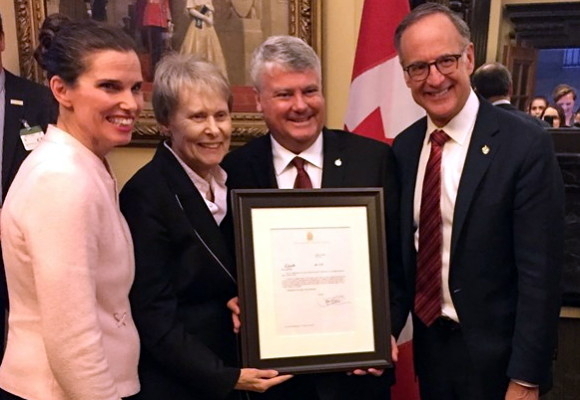 In her statement, Senator Bovey described Bondar’s commitment to championing the environment and its species, her efforts to capture and share its images, and her engagement initiatives with audiences and youth. 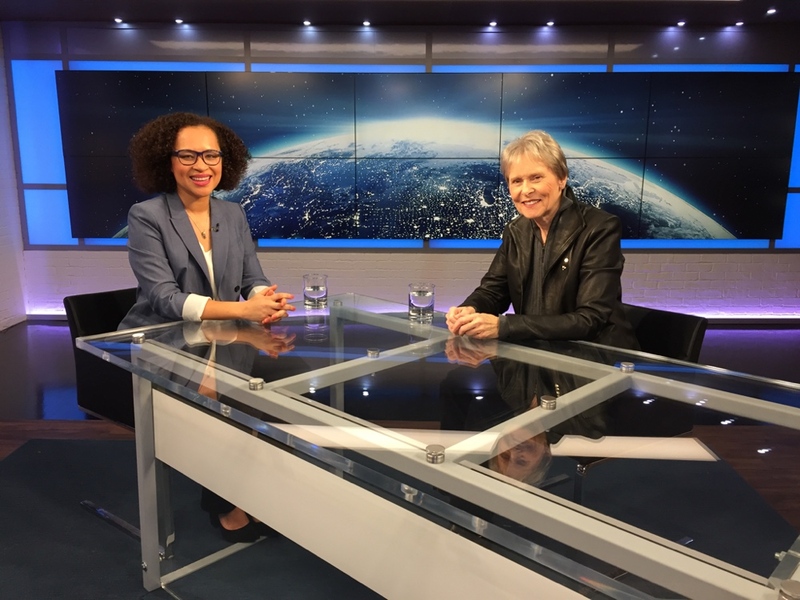 Global News Broadcast Journalist Susan Hay sits down with Dr. Roberta Bondar to discuss Life and Legacy and how the world’s first neurologist in space is Making a Difference. 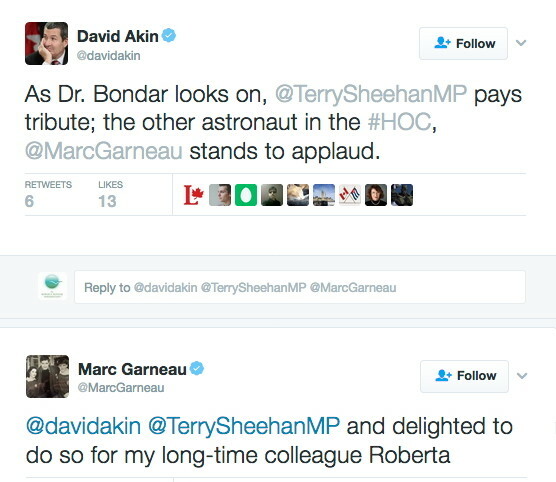 Terry Sheehan, MP, Sault Ste Marie, pays tribute to Dr Roberta Bondar in the House of Commons. 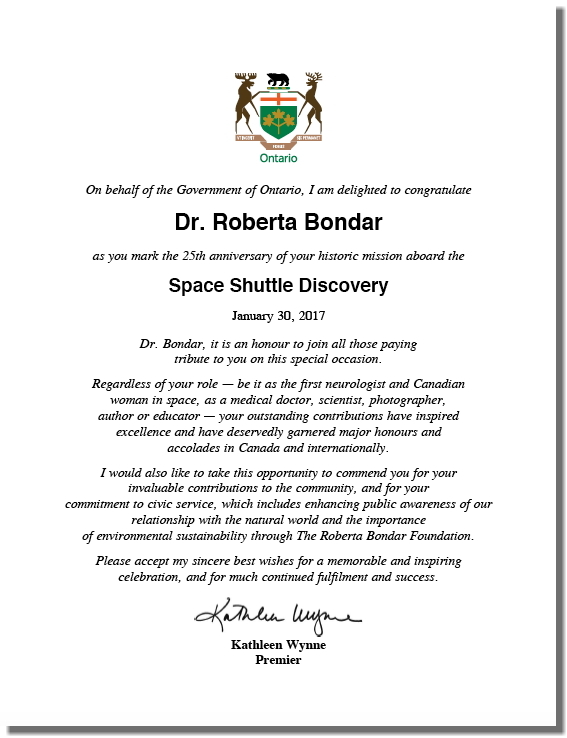 Ontario Premier Kathleen Wynne sent congratulations to Dr Roberta Bondar on the 25th anniversary of Dr Bondar’s flight aboard Space Shuttle Discovery‘s historic mission. The Premier also commended Dr Bondar’s contributions and commitment to the community, to civic service, and to raising awareness of our relationship with the natural world and the importance of environmental sustainability through The Roberta Bondar Foundation. 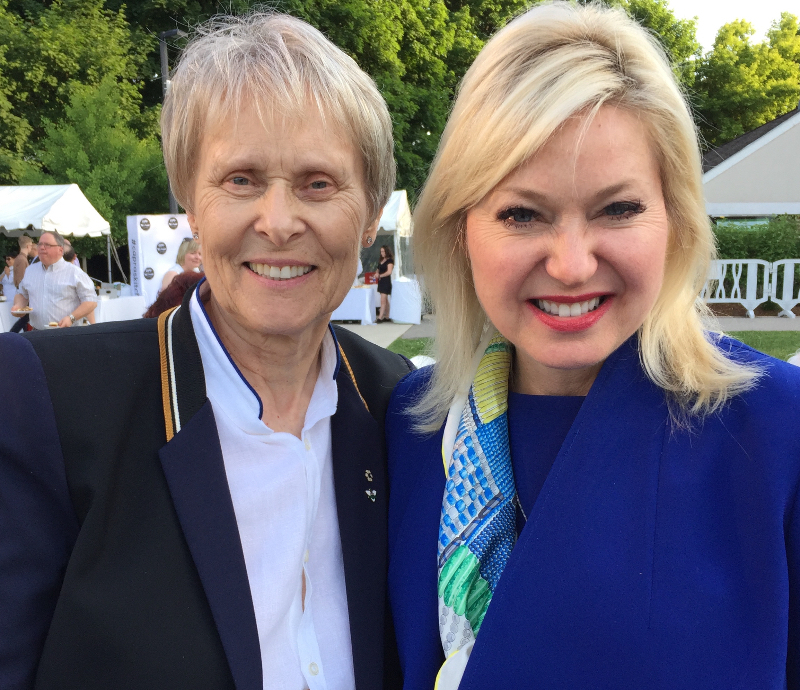 > Renzetti interviews Dr Roberta Bondar and reveals some of Bondar’s perspective on our planet, the effects of space flight on human health, and her commitment to reconnecting people to their natural environment. 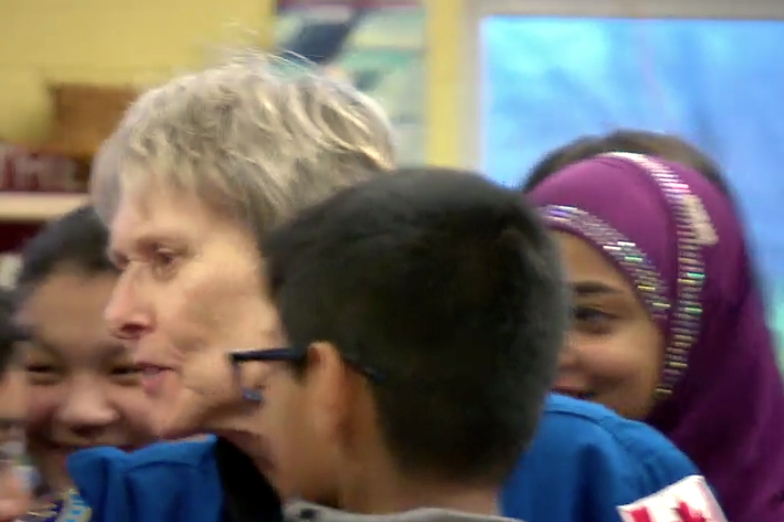 As a lead into Canada’s 150th birthday, Reg Sherren, a CBC feature journalist, follows Dr Roberta Bondar into Toronto’s Parkdale Jr and Sr school. 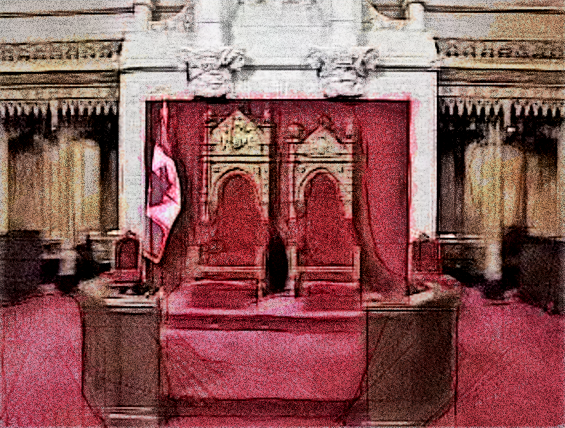 An effervescent storyteller, Sherren weaves fun, fact, and philosophy in The Next Canada a thoughtful vignette about Bondar’s values, salient background, defining moments, and present path. He checks out Dr Bondar as she takes him into one of her Foundation’s programs, The Bondar Challenge. The finale captures the mutual excitement and joy of Parkdale youth who have taken the challenge to reflect the world around them through the camera lens and become inspired by their environment. They are “The Next Canada” taking inspiration from Dr Bondar. CBC News Chief Correspondent, Peter Mansbridge engaged Dr Roberta Bondar in his weekly Mansbridge One On One to talk about the 25th anniversary of her space flight aboard Discovery… Their half hour of conversation recalled both the flight and her work aboard the First International Microgravity Laboratory and how its experience has touched her life. 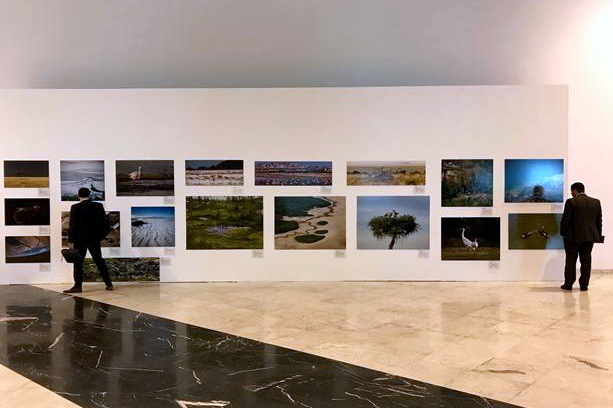 They discussed her present activities in professional landscape photography and some of the motivation for her Foundation’s environmental awareness and education programs. Mansbridge surprised Bondar with guests who each asked her opinion on different issues related to space and exploration. And more! 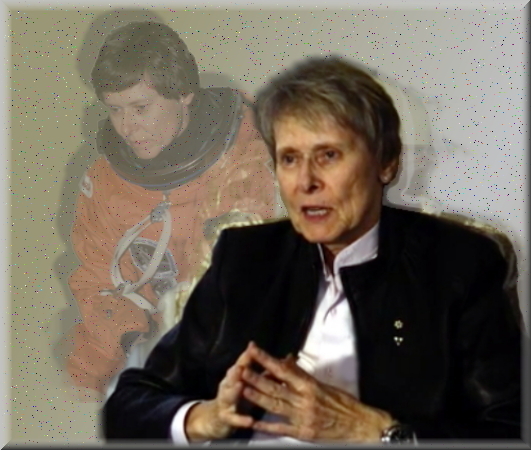 Kevin Bissett, The Canadian Press, speaks with Dr Roberta Bondar as she recalls the nerves, thrills of becoming Canada’s first woman in space. As world’s first neurologist in space, Bondar discusses the pressures she felt working on experiments that dozens of scientists from X countries had spent years preparing & which would be executed in Spacelab in a fraction of a week. And, however exciting the time in space, how that, too, was a fraction of her Life, a work in progress that continues to evolve. 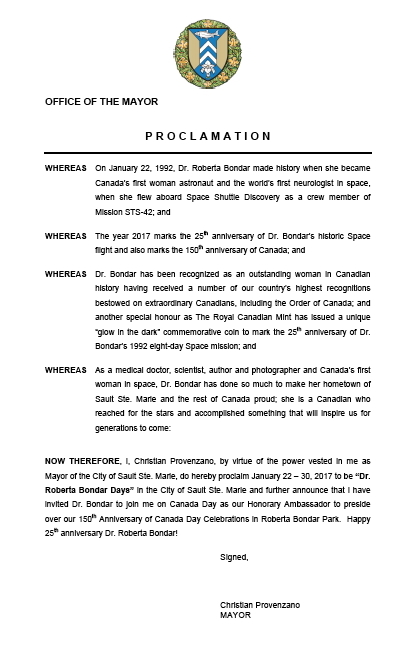 Sault Ste Marie, Ontario, January 19, 2017 – The Mayor of Sault Ste Marie read his proclamation before City Council and public online feed declaring January 22 -30, 2017 as Dr. Roberta Bondar Days. 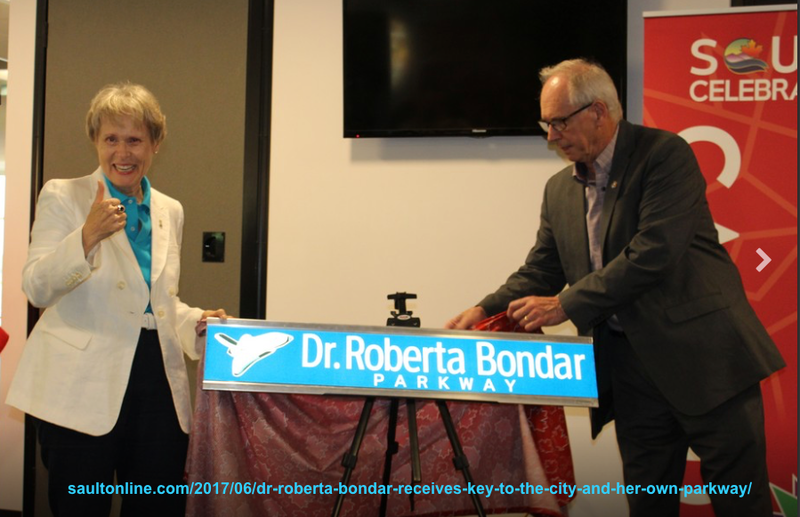 The Dr. Roberta Bondar Days are one of the City’s key initiatives to celebrate Canada’s 150th anniversary. The choice of January dates is a special silver anniversary tribute to Dr. Bondar’s January flight aboard Discovery on NASA’s historic First International Microgravity Laboratory [IML-1], STS-42 mission. 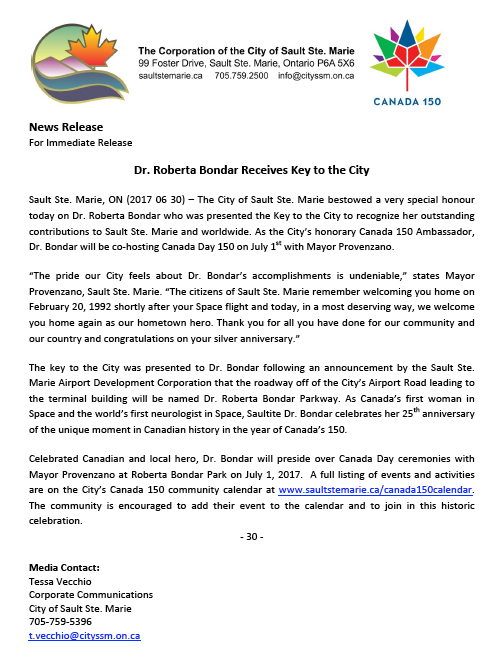 At Mayor Provenzano’s invitation, Dr. Bondar will join him on Canada Day as the City’s Honorary Ambassador to preside over its 150th Anniversary of Canada Day Celebrations in Roberta Bondar Park. Are you ready for January 22?